A culture / environment where people are comfortable giving and receiving feedback is essential in high performing teams. But having the courage and resilience to make this an effective practice can be very challenging. To get to the place where this is ‘how we do things here’ can take time, and relies heavily on a foundation of trust, strong relationships and a clarity of purpose. Leaders who want to establish a culture of peer-to-peer feedback should start by asking: “Have we got clarity around what we stand for?” Dooley says. Without it, “it’s just my opinion versus your opinion”. Our experience has confirmed the terrific value of peer feedback – especially where feedback focuses heavily on what is working, not just what is not. Feedback should come from a good place – where the intention is either to motivate or improve. If we have clarity of purpose, with a commitment to continually move forward towards that purpose, feedback can help us confidently take the steps in the right direction. Our blog post ‘What is the ideal praise to criticism ratio’ shares research which suggests top performing teams give each other more than 5 positive comments for every opportunity for improvement. Medium performing teams had a 2:1 ratio of positive to negative. Low performing teams had 3 negative comments for every positive one. So peer feedback is essential, but the balance needs to be right to ensure our impact is a positive one. As mentioned above, we believe a feedback rich culture relies heavily on a foundation of trust, strong relationships and a clarity of purpose. 1. Safety and Trust: put real attention into building relationships in order to build trust and work hard to make the feedback environment safe. 2. Balance: be sure to provide feedback about what is working, as well as what we can do better. 3. Normalcy: make feedback part of the way we interact with each other. 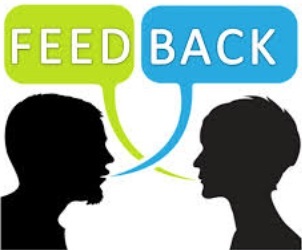 Ensure feedback is not something that only happens at the annual performance review or when something has gone wrong. It needs to be part of our every day interactions. 4. Personal Accountability: make the goal and expectation about feedback clear. The organisation needs to articulate that improving at giving and receiving feedback is an ongoing goal of ours, and everyone should explicitly ask for it often. We believe we need that we need to actively help people know how to give feedback to others, but also build skills in helping them to be on the receiving end of feedback. Being able to process and make sense of feedback isn’t easy for everyone. Some people need a little extra help to develop these important skills. Click here to see our tips and hints guide for being a better receiver of feedback.